James Ntambi, professor in the Department of Biochemistry and leading researcher in nutritional biochemistry, bends down in the Ugandan soil outside a primary school. His study abroad students huddle around him. He picks up a stick and begins to work math problems in the dirt. Ntambi started a study abroad program to Uganda at the University of Wisconsin–Madison 15 years ago, and it has since morphed into several successful parallel initiatives. Students can participate in a program called Agriculture, Health & Nutrition, where they take a seminar during the fall semester and then travel to Uganda in late December. Other students participate in UW Mobile Clinics & Health Care, traveling to Uganda in the summer. 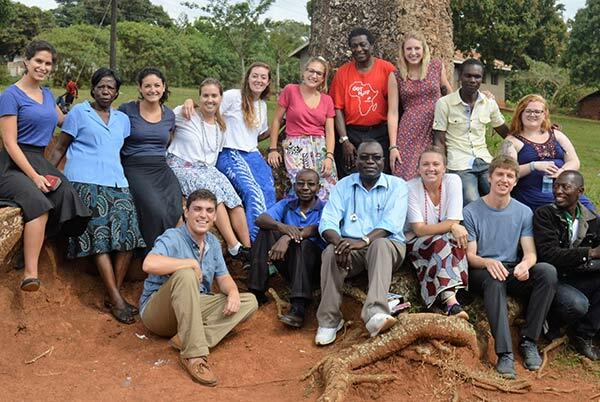 Programs also exist where medical students travel to Uganda. These programs have impacted more than 300 students at UW–Madison. The Department of Biochemistry also houses many other study abroad opportunities. Professor Marvin Wickens sends students each summer to work in labs in England, through the SCORE program, and Germany, through the Super G program, to gain valuable research and cultural experiences. The Khorana Program, run by professor Aseem Ansari, is an exchange program with India. On the trips to Uganda, students get a comprehensive view of health impacts by learning about the influences of agriculture, nutrition, health care, and sanitation. They also learn about social factors, such as economics and culture, that impact people’s ability to make decisions about their health and that of their family and community. This holistic approach makes this program unique and beneficial to students. In August, students help Ugandan doctors and nurses run mobile clinics that bring health care to villages where residents are unable to get to the country’s hospitals and clinics. Through touring hospitals and clinics, the students learn about the country’s health care system. hopes to return to Uganda during her career in healthcare. They spend time working on projects that influence sanitation and access to clean water. Ntambi also hasn’t overlooked the importance of agriculture in health. His students spend time around a large sustainable farm that some village residents use to feed themselves and sell the surplus to support their families. Biochemistry junior Caroline Kreitzer is about to travel to Uganda with Ntambi in late December. She says she’s excited about the trip and learning more about global health, which she plans to pursue as a career. The course offers flexibility so students can pick a specific topic they want to focus on. Kreitzer is interested in women’s health. Biochemistry’s study abroad programs have a lasting impact. For example, the Village Health Project is a UW–Madison student organization started in 2005 that sprung out of students’ interest in continuing a relationship with the villages they visited on the trip. Many other students find themselves going back to Uganda, as well.